Fine wheel-made (or handmade) burnished grey wares keep occurring in and around the Aegean area throughout the second millennium, but also in the preceding third and in the following first millennium B.C. What may (or may not) be just a coincidence, has often been interpreted as evidence for something (movement of people, development of culture, chronological cross-links), in the never ceasing search for comparative material, our favourite archaeological sport. Whereas in some cases it is clear that grey and grey is not always the same, there are other instances, which have kept archaeological discourse busy for well over a century now. This contribution intends to present a kind of entrée into the study of Aegean and Anatolian grey wares, on the background of the history of research, with an open eye also to the neighbouring regions, such as Bulgaria, Georgia and the Levant. Grey wares have received only a few monothematic studies and were mostly dealt with site by site, along with other types of pottery. Here it will be attempted to show the range of topics in which the grey wares have played a role, such as the origin of Middle Helladic culture, the coming of the Greeks, or the Indo-European invasion, none of which stood the test of time. Finally, we shall try to raise new issues which remain to be investigated in the future. The discussion will concentrate largely on the second millennium. At first the discussion swirled around the origin of grey ware. In Prehistoric Thessaly (1912) A.J.B. Wace and M.S. Thompson were the first to connect the grey ware at Troy with the grey ware as they knew it from mainland Greece, and extended the term Grey Minyan for both of them. In a reaction to this, E.J. Forsdyke (1914) wrote a much quoted article in Journal of Hellenic Studies, in which he pleads for a Trojan origin of the Grey Minyan Ware. Soon afterwards, V. Gordon Childe (1915) refuted the thesis, attempted to date both the Greek and Trojan finds using the then better known Minoan chronology and argued for a local origin of the Grey Minyan in central Greece. Later on, C.W. Blegen together with J.B. Haley wrote and influential double-article (Blegen 1928; Haley 1928), in which they connected the first occurrence of grey ware with the coming of the Greeks to the Aegean. Blegen also felt confirmed in this view by his excavations at Troy, which followed immediately afterwards. He saw a major break in the cultural development at the beginning of Troy VI and connected it via grey ware with the beginning of the Middle Helladic period in Greece. 1 By calling the Trojan grey ware ‘Grey Minyan Ware’, Blegen was likewise responsible for the definitive extension of the term to the Anatolian finds too, and by extension he even applied it to the Levantine and Cypriot finds, thanks to his other influential article in Klio, co-authored by A.J.B. Wace (Blegen – Wace 1939). Post WW II archaeology on western Anatolia witnessed a new upsurge, and there are a number of articles, mostly by James Mellaart and David French, which filled in an almost blank archaeological map, not only for the grey wares. Blegen’s publication of Troy VI material in 1953 seemed to offer a powerful tool for the analysis and dating of the various survey materials from the northwestern Anatolia. This misled Mellaart (1955) to apply the term Grey Minyan to wares found further inland as well, which we call now İnegöl Grey Ware and recognise as a separate independent ware. Yet later, using his knowledge gathered from Beycesultan and other Anatolian sites, Mellaart (1958) combined various strands of evidence ranging geographically from Caucasus, through Anatolia, Bulgaria to Greece and proposed a very ambitious hypothesis. He connected a wave of destructions, dated at that time roughly around 1900 BC, together with the first appearance of grey ware at Troy and in Greece (believed then to be simultaneous) with the arrival of the Indo-Europeans. Doing so, Mellaart in a way followed some of Blegen’s ideas, but stretched them much further. Yet what first looked like as an unprecedented archaeo-historical summary, began to crumble as new evidence came to light. The simultaneous wave of destructions around 1900 turned out to be a construct, and the whole thesis was rendered largely obsolete only two years later, when J.L. Caskey published his summary of the Early Bronze Age development in Greece, based upon his excavations in Lerna and Eutresis. It was at Lerna, where Caskey could show that the Grey Minyan has an Early Helladic III ancestry, which later became known as Fine Grey Burnished Ware (Rutter 1983). Some of Mellaart’s identifications and theses were later corrected by D. French (1967; 1969), who distinguished between inland grey wares around the Marmara sea, which he called İnegöl Grey Ware and coastal grey wares, which he termed Troy VI or Second Millennium Grey Ware. It was also French, who compiled a preliminary list of potential Grey Ware exports to the eastern Mediterranean and connected them with Troy (French 1969). In his final word on the grey wares in 1973, he stated quite clearly, that the grey ware in Anatolia is despite its similarity not an off-spring of Grey Minyan Ware and that it constitutes one of the varieties of local Bronze Age wares. In 1963, the first monographic work on Anatolian grey wares was completed by Nicholas Bayne but remained unfortunately unpublished until 2000. Bayne followed Mellaart’s other idea (1958; 1960), namely that Anatolian grey wares developed somewhere around present-day Kütahya and later spread towards the coast, which is possibly right. The book is a little outdated today, for example concerning Troy, but it still contains a wealth of information. This is especially true for some finds from the surveys of John Cook in the Troad and the old excavations in Bayraklı – Old Smyrna. Further research on grey wares on the Greek side of the Aegean concentrated less on great theories and more on publishing site materials, and promoting a better understanding of its internal development, which in turn helped to better define the distinguished phases of the Middle Bronze Age and early Late Bronze Age. Whereas the work of R. Howell (1973) and O.T.P.K. Dickinson (1977) was based largely on the still unpublished material from Lefkandi, J.L. Davis (1979) republished the old finds from Korakou and made a contribution to defining the grey ware of the Late Helladic I period. The work of G. Graziadio (1988) and S. Dietz (1991) on Shaft Grave period in the Argolid was not centred on grey wares, but contributed likewise to its definition during this period. The last considerable contribution was the publication of stratified sequence from Pefkakia and the less well stratified finds from Kiapha Thiti by J. Maran (1992a, 1992b), which supplied ample new information about the Central Greek development in general. Crucial is also the study of C. Zerner (1993), which showed new ways in handling the Middle Bronze Age wares. Using a petrographic approach, Zerner made a better distinction between the wheel-made True Grey Minyan, which she expects to have been produced in Central Greece, and some of its local, often handmade imitations. The occurrence of the grey ware imports on Cyprus around 1200 B.C. coincided roughly with the traditional date of the Trojan War as well as with new cultural and architectural developments on Cyprus at the beginning of Late Helladic IIIC. Grey wares were believed to be connected with another mythological tale, namely the arrival of Trojan refugees to Cyprus after the Trojan War. This led to a number of archaeological and historical interpretations, which are well summarized by S.H. Allen (1990; 1991; 1994) and A. Demetriou (1996). It was partly this Cypriot connection, but also the discovery of a grey ware crater at Tel Miqne-Ekron, which initiated Allen’s research on Late Bronze Age grey wares in the eastern Mediterranean and their relationship with the Trojan grey ware, and which resulted in a second monographic work on grey wares. Allen was not the first, but probably the most vocal advocate of a new name for grey ware in Anatolia. She suggested North-West Anatolian Grey Ware. However, scholars trained in Germany kept using the term Grey Minyan for Anatolia as well (Schachner 1994/95; 1999; Günel 1999a; 1999b; Pavúk 2002b), which became even more common with the new excavations at Troy under the late Prof. Manfred O. Korfmann. In any case, the renewed interest in Troy and a more profound knowledge of the material has shown quite clearly, that the application of the term ‘Grey Minyan’ for pottery from approx. the 14th–13th century or even later is not really meaningful and around 2002 the somewhat modified term “Anatolian Grey Ware” became utilized. Map 1. Geographical distribution of Grey Minyan and Anatolian Grey Wares. Grey ware, more specifically Grey Minyan Ware in this case, also played a role in some more exotic arguments, such as Vl. Milojčić’s fight for a low Neolithic chronology in southeastern Europe. One of his arguments was based on a kantharos fragment from Velika Humska Čuka, a site near the Serbian town of Niš (Milojčić 1949, 78). Such an approach was later justly criticised. For a new discussion of the Serbian finds see Maran (1998, 342). Let us summarise the Bronze Age whereabouts of this ware starting with Greece. 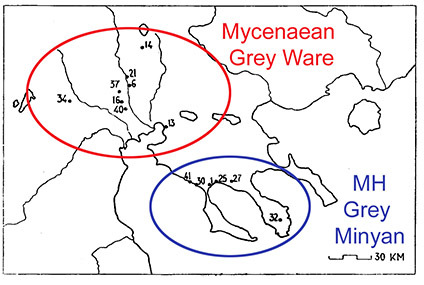 There is Early Bronze Age Grey Ware on Crete in Early Minoan II contexts (Betancourt 1985), but this seems to be only a local and short-lived phenomenon. Next comes the Early Helladic III predecessor of the better known Grey Minyan ware, the so called Fine Burnished Grey Ware first recognised by Caskey in Lerna (Caskey 1960, 296-297) and later described in more detail by J. Rutter (1983), which occurs largely in the Argolid and east central Greece. This led to the development of what is known as the “hallmark” of the Middle Helladic Period, a “hallmark” which, however, continued to exist in Late Helladic I or even slightly later. The name ‘Minyan’ allegedly stems from Heinrich Schliemann, who in fact never really used this expression in print. The various accounts of the history of Grey Ware usually quote E.J. Forsdyke (1914) referring to Schliemann. Forsdyke took it for a widely known fact and unfortunately did not go into detail. He quotes H. Bulle (1907) and his first volume of Orchomenos as a source, but Bulle does not really comment on this either. Grey wares called Minyan occur mainly in Central Greece, reaching into southern Thessaly and across the Peloponnese. There seems to be a wheel-made variant and also a number of local handmade imitations. Petrographic and chemical analyses are still in progress, but Zerner (1993) has suggested that most of the wheel-made pieces (which she terms True Grey Minyan) come from Central Greece, possibly the area of Orchomenos, and were widely exported. Given the fact that True Grey Minyan occurs in relatively large quantities not only at Orchomenos, but also on a number of Central Greek sites such as Eutresis (Goldman 1931), Thebes (Konsola 1985), Lefkandi, Kyrrha, Drachmani-Piperis, Dramesi and even farther north in Lianokladi (Wace – Thompson 1912), Pteleon and Pefkakia (Maran 1992a) as well as farther east at Eleusis (Mylonas 1975) and Kiapha Thiti (Maran 1992b) in Attica, it is unlikely that there was only one production centre. The better pieces from more distant regions, for example Lerna and the Argolid in general, may have been imported, but sites closer to Central Greece, such as Korakou (Blegen 1921, Davis 1979) in Corinthia, should be treated with caution in this respect. Certainly imported are the Grey Minyan vessels found on the islands. Whereas they are quite numerous on Keos and Aegina, they become less common on other islands, such as Melos, Paros, Siphnos and Tenos (Scholes 1956; Overbeck 1989a, 1989b; Davis 1986; Kilian-Dirlmeyer 1997, list on page 157). The occurrence on Crete is only very sporadic (Hood 1971). 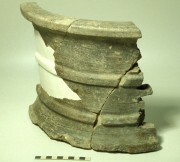 Grey Ware finds in coastal Chalkidiki hold a special position. Present are both wheel-made and handmade variants and the wheel-made variant can easily be termed True Grey Minyan. However, it is so far impossible to say, whether the wheel-made pieces were imported, and if so, then from where. The most notable sites are Agios Mamas, Molyvopyrgos and Torone (Radford – Heurtley 1927-28; Horejs 2007; Cambitoglou – Papadopoulos 1989). Note that the survey of Grey wares in Macedonia by D. French (1966, Fig. 3) also includes a number of inland sites. Better knowledge of both Macedonian Bronze Age and the development of the grey wares since then has shown that all of the inland finds belong to a much later type of grey ware, which is common in Late Helladic IIIC. With the Late Bronze Age the picture becomes more varied. The question of how long Grey Minyan remained in use has been debated on several occasions, and the discussion is well summarised in Kalogeropoulos (1998), with the most vocal proponent of survival of the Grey Minyan tradition into later periods being Klaus Kilian (1988a, 1988b). A number of sites certainly shows the evidence for Grey Minyan in Late Helladic I, especially in Central Greece, but it becomes less common in the Argolid (Peloponnese in general) and on the islands, that is areas where it used to be imported. The evidence becomes even thinner as we proceed into Late Helladic II. Here one has to mention the Grey Ware cups from Prosymna (Blegen 1937), which imitate the shapes of contemporary Mycenaean pottery, a trend that started already in Late Helladic I. 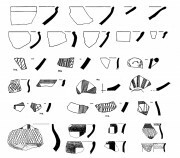 This trend seems to continue, and there are some Late Helladic IIIA, IIIB Grey Ware pieces in Mycenaean shapes from Tiryns (Kilian 1988a) and more recently also from Dimini (Adrimi-Sismani – Godart 2002, 101 Fig. 14), some of which, however, now seem to be rather of Italian inspiration (Jung 2007). Finally, there is a revival of Grey Ware in northern Greece during Late Helladic IIIC, which then continues into the Early Iron Age at sites such as Kastanas (Jung 2002) and Toumba Thessaloniki. For the last two issues see the contributions by R. Jung and S. Jimatzidis on this web-site. To make the picture complete, one should also mention the existence of grey ware in the Protogeometric period, as exemplified at Lefkandi. The Late Bronze Age islands seem to be less interested in grey wares, and one has to differentiate when referring to the Cyclades, Crete, northeast Aegean or southeast Aegean. In the Cyclades grey ware occurs only in a few cases on Keos in Late Helladic I and Late Helladic II contexts (Cummer – Schofield 1984, 47, 95), while it seems to be absent at other sites. Crete, on the contrary, offers a whole range of Late Bronze Age Grey Wares, some of which likewise betray an Italian origin, or at least inspiration. For more detail see the contribution by L. Girella on this web-site. The northeast Aegean islands will be dealt with together with Anatolian finds, but the southeast Aegean islands, such as Kos, Psara and Rhodes, show yet another type of Late Bronze Age Grey Wares, covering largely Late Helladic IIIA and IIIB. They are a mixture of local elements, Anatolian influences and Mycenaean shapes (Benzi 1996; Girella 2005). As for Anatolia, grey wares in general seem to be typical of its northwestern part. Troy used to be the best excavated and most known site, suggesting that it is a type-site of the region (Blegen et al. 1953, 1958). Only later research showed that what possibly holds true for the third millennium does not really apply to the second millennium. Therefore, starting with Troy VI (around 1750 B.C. ), one must differentiate between the coastal strip and the inland areas. 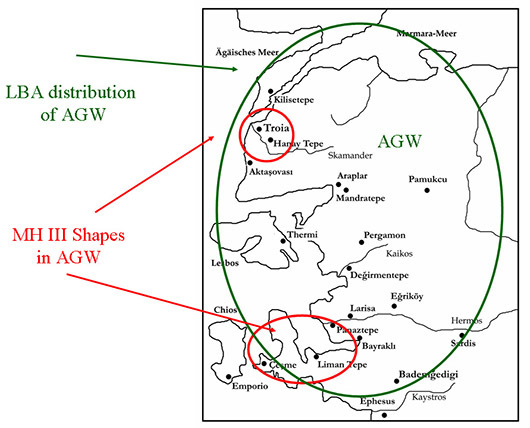 There is so far no Grey Ware (Anatolian or Aegean) in the coastal regions of western Anatolia during the earlier stages of the Grey Minyan Ware (GMW) development in Greece, that is, during Early Helladic III, Middle Helladic I and possibly also during most of Middle Helladic II. However, farther inland (and farther means 300 km in this case) two independent grey wares emerge in this early period: one from around the modern town of Kütahya and another one 100 km northwards from around Lake İznik. The first has no name so far, but one could call it ‘Tavşanlı Grey Ware’ after the most prominent site in the area (Mellaart 1958, 17; 1960; Bayne 2000, 16-17). It is mostly handmade and burnished to a high metallic lustre. The second is better known and was labelled by others as İnegöl Grey Ware (İGW), likewise after a prominent site in the area (Bittel 1942, 159-162; French 1967, 61-64). It is either handmade or produced on a slow wheel and is typically distinguished by its burnished decoration. In terms of fabric and surface treatment, İGW is surprisingly similar to the True Grey Minyan Ware, and it was this ware that Mellaart wanted to see as a predecessor of GMW in Greece (Mellaart 1958, 18). Yes, the İGW does have the renowned soapy touch, just like the best GMW, but the range of shapes is quite limited (shallow bowls and plates) and totally different from the Grey Minyan spectrum (French 1967, 61-64; Thissen 1989/90, Fig. 18:3-6). Unfortunately, both of these inland grey wares are known only from surveys, and so we know little about their dating and internal development. The bulk of them must be of Troy V date (that is Middle Helladic I and II), but they probably continued later on as well (Pavúk 2007). For this reason, it is also not clear which sites are earlier and which are later, and, for that matter, also how and when these grey wares spread westwards to the coast. Evidence for the coast is not overwhelmingly plenteous, for the only two well-researched regions are the Troad and the area of İzmir, which lie 250 km apart. At Troy there is a continuous sequence from the Early Bronze Age to the end of Late Bronze Age, whereas sites around İzmir do not have such complete sequences. However, there are four or five sites, and the sequences at these sites complement each other (Liman Tepe, Panaztepe, Kocabaştepe, Smyrna and Çeşme). 2 One can therefore say, that the first occurrence of grey wares at Troy, but also at other sites down the coast, coincides with the beginning of Troy VI, which starts somewhere around the turn of Middle Helladic II to Middle Helladic III (Pavúk 2002b; 2007a; 2007b). 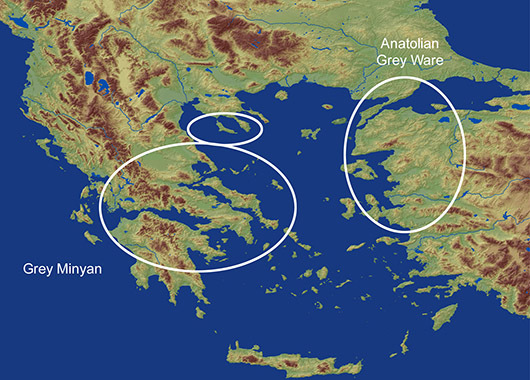 During this period (Middle Helladic III), a grey ware in Aegean shapes appears on the coast at Troy and around İzmir. The Aegean shapes are accompanied by Anatolian shapes in grey ware as well as in other local burnished wares, but the Aegean influence remains restricted to the coast. After a couple of generations, roughly during Late Helladic I, the Aegean shapes suddenly disappear, and for the first time a more or less unified ceramic horizon spreads over the whole of northwestern Anatolia, represented by various carinated two-handled ribbed bowls. A similar development, alas in different wares, can be observed also in southwestern Anatolia. By now (Late Helladic I) the Grey Minyan Ware in Greece dies out slowly, but the Anatolian Grey Ware flourishes and continues. Whereas it becomes the dominant ware at Troy, it seems to be just one among several other wares at sites farther south and east. This changing ratio is, for example, something that needs to be followed more closely in the future. By Late Helladic III the coastal zone and the littoral islands not only get Mycenaean decorated pottery, but Mycenaean shapes are imitated as well in local burnished unpainted wares, most prominently in Anatolian Grey Ware. Interestingly, just as the Middle Helladic goblets never penetrated inland, neither did the later Mycenaean shapes in local pottery. Both remain restricted to the coast (Pavúk 2002b; 2005). Map 4. Anatolian Grey Ware in Western Anatolia. The coastal and inland sites. The known sites with the occurrence of Anatolian Grey Ware can be summarised as follows: The Troad is dominated by Troy, but there is also Hanay Tepe (Lamb 1932; Schachner 1999), Hanay Tepe-Bozköy, Larisa-Liman Tepe in the Troad as well as some other, less known sites (Aslan at al. 2003). There is also an important Late Bronze Age cemetery at Beşik Tepe dating to Late Helladic IIIA2–B1. Moving over the Ida-range into the Edremit plain there is Araplar-Mandratepe (Özdogan 1993, Bayne 2000), a site with great potential but scarcely researched so far. In the Balikesir basin there is another promising site, Pamukcu (French 1969, 44-45), known only from surveys. The Kaikos valley yields sites such as Pergamon (Radt 1992) and Değirmentepe (Driehaus 1957) and also some smaller ones. On the Hermos River there are Larisa (Boehlau – Schefold 1942), Eğriköy (French 1969, 52-53) and Sardis (Spier 1983). Finally, around İzmir bay are Panaztepe, Byraklı, Limantepe, Kocabaştepe and Çeşme (Ersoy 1988; Günel 1999a; 1999b; Bayne 2000; Erkanal-Karaturgut 2004; Şahoğlu 2007). For the time being, the southernmost site yielding Anatolian Grey Ware is the Bademgediği Tepe near the Classical site of Metropolis (Meriç 2003). There is for example no Grey Ware from Ephesos, situated only a couple of kilometers further south, so that we can be quite specific, that the southern border of the Grey Ware-zone is to be placed somewhere between these two sites. What exactly happened during the 6th century and when the grey ware ended, remains to be investigated yet. There is, however, EIA grey ware from the Persian Satrap seat of Daskylaion, and there is also Phrygian Grey Ware best represented at Gordion. These are possibly local developments, yet it would be interesting to know whether there are some mutual influences. Even more so, since some of the Phrygian Grey Ware shapes (especially the plates) look almost identical to some İnegöl Grey Ware pieces (in terms of shapes, surface treatment, pattern burnishing as well as the fabric and the firing conditions), which are well one millennium earlier. Within the northeast Aegean islands only Lemnos and Lesbos seem to have played a key role in terms of grey wares. The islands of Gökçada-Imbros and Bozcaada-Tenedos are not researched well enough to say much, but no grey ware has been reported there thus far. Samothrace is better researched with only one grey ware sherd reported (D. Matsas, pers. comm.). There are three sites of potential interest on Lemnos: Poliochni and Koukonisi in the south, with Hephaestia in the north. The reported grey wares from Poliochni (Cultraro 2001; 2007) are somewhat doubtful and hard to judge for the time being. By contrast, a whole range of possibly imported grey wares was recently reported in Koukonisi. They seem to start in Middle Helladic II/III, but might just as well cover the later phases of the Anatolian Grey Ware (Petrakis – Moutzouridis, in print). The latter are also known from Hephaestia, where Late Helladic IIIB deposits yielded some grey ware fragments. Hephaestia is known also for a long production of Iron Age Grey wares. Whether there was continuity from the Bronze Age remains to be postulated (Messineo 1997; 2001; Privitera 2005). Moving south, the island of Lesbos offers two major sites. Miss Lamb spoke quite frequently about Lesbian red and grey wares in her publication on the 2nd millennium levels at Thermi, but in fact very little can be termed grey, neither from the lower levels, roughly contemporary with the Shaft Grave period in Greece, nor from the Late Helladic IIIA levels on top of them (Lamb 1936, 136-145). The situation is different in the north, especially at Antissa. Here we do find Anatolian Grey Ware par excellence, but it is c. Late Helladic IIIA in date. The published pedestalled bowl/krater is almost identical with similar pieces from the Beşik Tepe cemetery, the harbour of Troy (Lamb 1930-31, Fig. 2-3; Basedow 2000, Taf. LXXVIII). This is not surprising, as Antissa is situated right across the straits from Assos. Grey ware finds from Chios are not numerous, yet they do show a surprising variability (Hood 1982, 571-573 Fig. 255 Pl. 113). They come from various levels and several fabrics are represented, all of which seem to be imported. Some of the grey ware sherds can be roughly contemporary with Late Helladic IIIA or IIIB, for example, one carinated cup (2645) or a fenestrated stand (2654), but a piece of a ‘Mycenaean Deep bowl’ might even be of a Late Helladic IIIC date. These can all be easily considered Anatolian Grey Ware. However, closer inspection revealed that some of the sherds were not drawn properly and that two wheel-made, hard-fired fragments with matching fabric (2652, 2653) were actually tankards and not jugs, as claimed in the publication (Pavúk in print). Finally, Samos seems to be culturally less independent (compared to the islands just mentioned), and the local pottery clearly looks towards the southwest Anatolian ceramic province. Noteworthy for this survey is an almost complete grey ware bowl that was published by Milojčić from the site of the later Heraion (Milojčić 1961, Taf. 49:21). Judging by the published profile, the piece fits nicely within the Anatolian Grey Ware range of shapes and dates roughly to Late Helladic I or even later. Being a unique piece, it must have been imported. Even though somewhat farther away, the Georgian grey wares should certainly be mentioned on this web-site. 3 They look surprisingly similar to the Anatolian Grey Ware, but are most likely a local development. There are basically two types. The older type dates to around the 16th–17th centuries B.C. and is typically decorated with pattern-burnishing in a metope-like style. The entire vessel, mostly kantharoi, is nicely burnished except for one or two rectangular fields on the shoulder/belly, which are then decorated with a burnished zig-zag line on the unburnished background. Some vessels can be seen in the Mtscheta and Achaltziche Archaeological Museums. The second, later type of grey ware is certainly wheel-made and dates to some time around the 12th–13th centuries. It shows a range of shapes, including even mugs, pilgrim flasks and kalathoi, often decorated with incised wavy-lines. Some are exhibited in the State Museum in Tbilisi (Tiflis) and in the Archaeological Mission in Dušeti. These are usually taken to be the result of an Anatolian or even Aegean influence, but it is hard to see how such an influence should have functioned. Namely, the most numerous grey wares are not found in the western, coastal part of Georgia, but rather in the eastern part, in central Caucasus. The relationship of the two to one another as well as with other grey wares remains unclear. Judging from the published evidence thus far, there seems to be no local production of Bronze Age grey wares from areas north of Rhodopes so far. However, given the geographical proximity of the grey ware production centres in northern Greece and in northwestern Anatolia, one would expect to find grey ware imports in Bulgaria as well. The Black Sea coast or the valleys of the north Aegean rivers would be likely candidates. Indeed, there are imports reported from the lower Maritsa valley, unfortunately not as numerous as one might have hoped for. However, a newly discovered coastal site of Vratitsa might tell us more, when further explored (Leshtakov 2007). There is a grey pilgrim flask from the tell-settlement of Gălăbovo dated roughly to the beginning of the 2nd millennium (most recently Leštakov 2002) and a handful of sherds decorated with incised multiple wavy-lines from a survey in the vicinity of the Drama settlement, published as Late Bronze Age (Lichardus 2002, 152). The provenience of both has been assigned to Anatolia, which is probably a reasonable guess, nevertheless not without problems. The flask is very early, and there are no contemporary grey ware finds from the coastal Anatolia. Perhaps it is from farther inland, which the vessel-shape itself would also suggest. Whereas this piece is quite enigmatic, the sherds from Drama seem to be common northwest Anatolian kraters decorated with wavy-lines. The likely problem rests, however, upon the dating of these finds. They cannot be dated just by shape (represented are only body sherds, no rims) or the type of the wavy-line (no straightforward development of the wavy-lines recognised so far), neither by their context (mostly survey finds). This kind of decoration and vessel shape first occurs at Troy around the 15th century, peaks around the 13th century and continues until the end of the millennium to become more fashionable again during the 8th and 7th centuries B.C. It is, therefore, hard to be more specific about their dating. A date in the Early Iron Age is just as likely. Such a date would be strengthened by the occurrence of the Archaic Grey Ware, known also as Aeolic Bucchero, at several sites in Bulgaria (Nikov 1999). The amount of evidence is quite large now, so that it becomes less clear, whether all of these should be imports from coastal Anatolia, or whether they were produced locally. Sherds of burnished wheel-made grey ware, found in Cyprus and the Levant mostly in 12th -13th century B.C. contexts, have long been recognised as something alien, most probably Anatolian in origin. David French, Hans-Günter Buchholz and Susan Heuck Allen carried out pioneer work and compiled lists of all known grey ware finds from the aforementioned areas, with the work of Allen being the most recent and most concise contribution (Buchholz 1973; French 1969, 68-72; Allen 1990. See also Allen 1991; 1994 and Schachner 1997). As a source, Troy has most often been suggested. Since, however, in this case the visual inspection had reached its objective limits and could not go beyond a general statement of overall close similarity, the chemical analysis seemed to be the only way to test this hypothesis. Allen, therefore, sampled almost all existing grey and tan ware finds in the eastern Mediterranean, and the samples were later analysed at her request using Neutron Activation Analysis by the University of Manchester as part of a larger project under the archaeological direction of Elizabeth French for the Bronze Age. This was subsumed into the Major British Academy Research Project on Bronze Age Trade. Summaries of the relevant work conducted were presented in E. French (1991) and N. Bryan et al. (1997). See also the archive website of the Manchester archaeometry program http://archaeometry.missouri.edu/datasets/uman/index.html. Analysis was carried out in 1991 by the archaeometry group in the Chemistry Department of the Manchester University; involved were N. Bryan, S. Hoffmann and V. Robinson (Bryan et all. 1991; Hoffmann and Robinson 1993). In order to determine whether or not the sherds came from Troy, a number of available Trojan sherds preserved in the study collections of the British School at Athens, the Department of Classics, University of Cincinnati and the Manchester Museum were also sampled for analysis. The result was that the majority of these grey ware finds are indeed imports from Troy. The publication of the data was delayed somewhat, but it will be issued in a short time (Mommsen – Pavúk 2007). Adrimi-Sismani, V., and L. Godart 2002. “Αρχαία Ιωλκός. Μια πρώτη προσεγγισή.” In Μνημεία της Μαγνήσιας. Πράκτικα Συνεδρίου „Αναδείξη του διαχρονικού μνημειάκου πλουτού του Βόλου και της ευρυτέρης περιοχής“. Βόλος 11–13 Μαϊού 2001, 94–107. Volos. Allen, S.H. 1990. Northwest Anatolian Grey Wares in the Late Bronze Age: Analysis and Distribution in the Eastern Mediterranean. Unpublished PhD. Dissertation, Brown University. UMI 9101726. Ann Arbor. Allen, S.H. 1991. “Late Bronze Age Grey Wares in Cyprus.” In Cypriot Ceramics: Reading the Prehistoric Record, edited by J.A. Barlow, D.L. Bolger, and B. Kling, 151-167. University Museum Publications, University of Pennsylvania. Philadelphia. Allen, S.H. 1994. “Trojan Grey Ware at Tel Miqne – Ekron.” Bulletin of the American Schools of Oriental Research 293:39-51. Aslan, R., G. Bieg, P. Jablonka, and P. Krönneck 2003. “Die mittel- bis spätbronzezeitliche Besiedlung (Troia VI und Troia VIIa) der Troas und der Gelibolu-Halbinsel. Ein Überblick.” Studia Troica 13:165-213. Basedow, M.A. 2000. Beşik-Tepe. Das spätbronzezeitliche Gräberfeld. Studia Troica Monographien 1. Mainz am Rhein. Bayne, N.P. 1963 (2000). 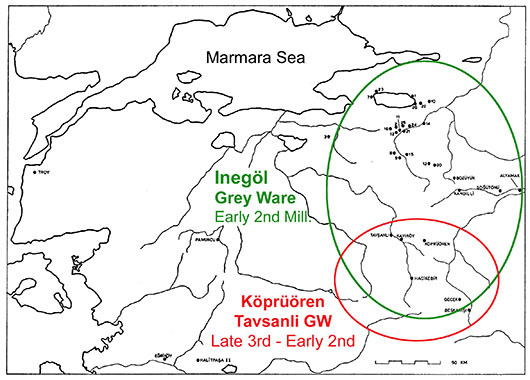 The Grey Wares of Northwest Anatolia in the Middle and Late Bronze Age and Early Iron Age and their Relation to the Early Greek Settlements. Asia Minor Studien 37. Bonn. Benzi, M. 1996. “Problems of the Mycenaean Expansion in the South-Eastern Aegean.” In Atti e memorie del secondo Congresso internazionale di micenologia, Roma-Napoli, 14-20 ottobre 1991. Volume 3: Archeologia, edited by E. De Miro, L. Godart, and A. Sacconi, 947-978. Incunabula Graeca 98.Rome. Betancourt, Ph.P. 1985. The History of Minoan Pottery. Princeton University Press, Princeton. Bittel, K. 1956. Review of Troy III, The Sixth Settlement, by C.W. Blegen et al. Gnomon 28:241-252. Bittel, K. 1942. “Kleinasiatische Studien.” IstMitt 5:1-204. Blegen, C.W. 1921. Korakou. Boston - New York. Blegen, C.W. 1928. “The Coming of the Greeks II: The Geographical Distribution of Prehistoric Remains in Greece.” AJA 32:146-154. Blegen, C.W. 1937. Prosymna: The helladic Settlement Preceding the Argive Heraeum. Cambridge. Blegen, C.W., J.L. Caskey, and M. Rawson. 1953. Troy III: The Sixth Settlement. Princeton. Boehlau, J., and K. Schefold, eds. 1942. Larisa am Hermos: Die Ergebnisse der Ausgrabungen 1902-1934. Band III: Die Kleinfunde. Berlin. Bryan, N.D., E.B. French, S.M.A. Hoffman et al. 1997. “Pottery sources in bronze age Cyprus. A provenance study by neutron activation.” RDAC 1997:31-64. Bryan, N.D., S.M.A. Hoffman, and V.J. Robinson 1991. Neutron Activation Analysis of Bronze Age Grey Minyan Wares. Unpublished manuscript. Manchester. Buchholz, H.-G. 1973. “Grey Trojan Ware in Cyprus and North Syria.” In Bronze Age Migrations in the Aegean. Archaeological and linguistic problems in Greek prehistory,edited by Crossland, R. A., and A. Birchal, 179-187. London. Bulle, H. 1907. Orchomenos I. Die älteren Schichten. München. Cambitoglou, A., and J.K. Papadopoulos 1991. “Excavations at Torone, 1989.” MeditArch 4:147-171. Caskey, J.L. 1960. “The Early Helladic Period in the Argolid.” Hesperia 29:285-303. Childe, G. 1915. “On the Date and Origin of the Gray Minyan Ware”. JHS 35:196-207. Cultraro, M. 2001. “Indizi della sopravvivenza di Poliochni (Lemnos) nella media e tarda età del Bronzo.” In Studi in Preistoria e Protostoria in onore di Luigi Bernabò Brea, edited by Martinelli, M.C., and U. Spigo. Quaderni del Museo Archeologico Regionale Eoliano, Supplemento I, 213-240. Messina. Cultraro, M. 2007. “The Middle Bronze Age Pottery Sequence in the Northern Aegean Islands.” In Middle Helladic Pottery and Synchronisms. Proceedings of the International Workshop held at Salzburg, October 31st-November 2nd, 2004, edited by Felten, F., W. Gauß, and R. Smetana, 323-332. Ägina-Kolonna, Forschungen und Ergebnisse I, CChEM 14. Vienna. Cummer, W. W., and E. Schofield 1984. Keos III. Ayia Irini: House A. Mainz on Rhine. Davis, J. L. 1979. “Late Helladic I Pottery from Korakou.” Hesperia 48:234-263. Demetriou, A. 1996. “Traditional dating of the Trojan War and Cypriot archaeology.” In Atti e memorie del secondo Congresso internazionale di micenologia, Roma-Napoli, 14-20 ottobre 1991. Volume 3: Archeologia, edited by E. De Miro, L. Godart, and A. Sacconi, 1423-1431. Incunabula Graeca 98.Rome. Dickinson, O.T.P.K. 1977. Origins of Mycenaean Civilisation. Studies in Mediterranean Archaeology 49. Göteborg. Dietz, S. 1991. The Argolid at the Transition to the Mycenaean Age. Studies in the Chronology and Cultural Development in the Shaft Grave Period. Copenhagen. Driehaus, J. 1957. “Prähistorische Siedlungsfunde in der unteren Kaikosebene und an dem Golfe von Çandarlı.“ IstMitt 7:76-101. Erkanal, H., and E. Karaturgut 2004. “2002 yılı Çeşme-Bağlararası kazıları.” XXV. Kazı Sonuçları Toplantısı -2:153-164. Ersoy, Y. 1988. “Finds from Menemen/Panaztepe in the Museum of Manisa.” BSA 83:55-82. Forsdyke, E.J. 1914. “The Pottery called Minyan Ware.” JHS 34:126-156. French, D.H. 1966. “Some problems in Macedonian Prehistory.” Balkan Studies 7:103-110. French, D.H. 1967. “Prehistoric Sites in Northwest Anatolia I: The İznik Area.” AnatSt 17:49-100. French, D.H. 1969. “Prehistoric Sites in Northwest Anatolia II: The Balıkesir and Akhisar/Manisa Area.” AnatSt 19:41-98. French, D.H. 1973. “Migrations and ‘Minyan’ Pottery in Western Anatolia and the Aegean.” In Bronze Age Migrations in the Aegean. Archaeological and linguistic problems in Greek prehistory, edited by R.A. Crossland, and A. Birchal, 51-54. London. French, E.B. 1991. “Tracing exports of Mycenaean pottery. The Manchester contribution.” In Bronze age trade in the Mediterranean. Papers presented at the conference held at Oxford in December 1989, edited by Gale, N.H., 121-125. Studies in Mediterranean Archaeology 90. Jonsered. Girella, L. 2005. “Ialysos, foreign relations in the late bronze age. A funerary perspective.” In EMPORIA. Aegeans in central and eastern Mediterranean. Proceedings of the 10th International Aegean Conference / 10e Rencontre égéenne internationale, Italian School of Archaeology in Athens, 14-18 April 2004, edited by Laffineur, R., and E. Greco, 129-139. Aegaeum 25. Liège - Austin. Goldman, Hetty 1931. Excavations at Eutresis in Boeotia. Cambridge, Mass. Graziadio, G. 1988. “The Chronology of the Graves of Circle B at Mycenae: A New Hypothesis.” AJA 92:343-372. Günel, S. 1999a. Panaztepe II. Die Keramik von Panaztepe und ihre Bedeutung für Westkleinasien und die Ägäis im 2. Jahrtausend. Türk Tarih Kurumu Yayınlarından VI, 51. Ankara. Günel, S. 1999b. “Vorbericht über die mittel- und spätbronzezeitliche Keramik von Liman Tepe.” IstMitt 49:41-82. Haley, J. B. 1928. “The Coming of the Greeks I: The Geographical Distribution of Pre-Greek Place Names.” AJA 32:141-145. Hoffmann, S.M.A., and V.J. Robinson 1993. “Neutron Activation Groupings of Imported Material from Tell Abu Hawam. Appendix to French, E. B., 1993, Wace and Blegen: Some introductory thoughts and a case study.” In Wace and Blegen. Pottery as evidence for trade in the Aegean bronze age, 1939 - 1989. Proceedings of the international conference held at the American School of Classic Studies at Athens, December 2 - 3, 1989, edited by Zerner, C. et al., 7-10. Amsterdam. Hood, S. 1971. “An Early Helladic III import at Knossos and Anatolian connections.” In Mélanges André Varagnac, 427-436. Paris. Hood, S. 1982. Prehistoric Emporio and Ayio Gala. Excavations in Chios 1938-1955, Volume II. The Annual of the British School of Archaeology at Athens, Supplementary Volume 16. London. Horejs, B. 2007. “Transition from Middle to Late Bronze Age in Central Macedonia and its Synchronism with the "Helladic World".” In Middle Helladic Pottery and Synchronisms. Proceedings of the International Workshop held at Salzburg, October 31st-November 2nd, 2004, edited by Felten, F., W. Gauß, and R. Smetana, 183-199. Ägina-Kolonna, Forschungen und Ergebnisse 1, CChEM 14. Vienna. Howell, R.J. 1973. “The Origins of the Middle Helladic Culture.“ In Bronze Age Migrations in the Aegean. Archaeological and linguistic problems in Greek prehistory,edited by Crossland, R. A., and A. Birchal, 73-106. London. Jung, R. 2002. Kastanas. Die Drehscheibenkeramik der Schichten 19 bis 11. Prähistorische Archäologie in Südosteuropa 18. Kiel. Jung, R. 2007. ΧΡΟΝΟΛΟΓΙΑ COMPARATA. Vergleichende Chronologie von Südgriechenland und Süditalien von ca. 1700/1600 bis 1000 v. u. Z. Veröffentlichungen der Mykenischen Kommission 26, Denkschriften der phil.-hist. Klasse 348. Wien. Kalogeropoulos, K. 1998. Die frühmykenischen Grabfunde von Analipsis (südöstliches Arkadien). Mit einem Beitrag zu den palatialen Amphoren des griechischen Festlandes. Bibliothek der Archäologischen Gesellschaft zu Athen 175. Athen. Kilian, K. 1988a. “Ausgrabungen in Tiryns 1982/83.” AA 1988:105-151. Kilian, K. 1988b. “Mycenaeans Up To Date. Trends and Changes in Recent Research.” In Problems in Greek Prehistory. Papers Presented at the Centenary Conference of the British School of Archaeology at Athens, Manchester, April 1986, edited by French, E.B., and K.A. Wardle,115-152. Bristol. Konsola, D. 1985. “Preliminary Remarks on the Middle Helladic Pottery from Thebes.” Hydra 1:11-17. Lamb, W. 1931-32. “Antissa.” BSA 32:41-67. Lamb, W. 1932. “Schliemann’s Prehistoric Sites in the Troad.” PZ XXIII:111-131. Lamb, W. 1936. Excavations at Thermi on Lesbos. Cambridge. Leshtakov, K. 2002. “Galabovo Pottery and a New Synchronisation for the Bronze Age in Upper Thrace with Anatolia.” Anatolica 28:171-201. Leshtakov, K. 2007. “The Eastern Balkans in the Aegean Economic System during the LBA. Ox-Hide and Bun Ingots in Bulgarian Lands.” In: Between the Aegean and Baltic Seas. Prehistory across Borders. Proceedings of the International Conference ‘Bronze and Early Iron Age Interconnections and Contemporary Developments between the Aegean and the Regions of the Balkan Peninsula, central Europe and Northen Europe,’ University of Zagreb, 11-14 April 2005, edited by Galanaki, I., H. Tomas, Z. Galanakis, and R. Laffineur, 447-461. Liège-Austin. Lichardus, J. et al. 2002. “Die Spätbronzezeit an der unteren Tundža und die ostägäischen Verbindungen in Südostbulgarien.” Eurasia Antiqua 8:135-183. Maran, J. 1992a. Die Deutschen Ausgrabungen auf der Pevkakia-Magula in Thessalien III: Die Mittlere Bronzezeit. Beiträge zur ur- und frühgeschichtlichen Archäologie des Mittelmeer-Kulturraumes 30-31.Bonn. Maran, J. 1992b. Kiapha Thiti. Ergebnisse der Ausgrabungen II 2 - 2. Jt. v. Chr. : Keramik und Kleinfunde. Marburger Wincelmann-Programm 1990. Marburg. Maran, J. 1998. Kulturwandel auf dem griechischen Festland und den Kykladen im späten 3. Jahrtausend v. Chr. : Studien zu den kulturellen Verhältnissen in Südosteuropa und dem zentralen sowie östlichen Mittelmeerraum in der späten Kupfer- und frühen Bronzezeit. Universitätsforschungen zur prähistorischen Archäologie 53. Bonn. Mellaart, J. 1955. “Some Prehistoric Sites in North-Western Anatolia.” IstMitt 6:53-88. Mellaart, J. 1958. “The End of the Early Bronze Age in Anatolia and the Aegaean.” AJA 62:9-33. Mellaart, J. 1960. “The Origin of Minyan Ware.” In Ve Türk Tarih Kongresi, 146-156. Ankara. Meriç, R. 2003. “Excavations at Bademgediği Tepe (Puranda) 1999-2002: A Preliminary Report.” IstMitt 53: 79-98. Messineo, G. 1997. “Gli scavi di Efestia a Lemno. Tradizione micenea nella civiltà tirrenica.” SMEA 39:241-252. Messineo, G. et all. 2001. Efestia. Scavi Adriani 1928 - 1930. Monografie della Scuola archeologica di Atene e delle missioni italiane in Oriente, 13. Padova. Milojčić, V. 1949. Chronologie der jüngeren Steinzeit Mittel und Südost Europas. Berlin. Milojčić, V. 1961. Samos I. Die prähistorische Siedlung unter dem Heraion. Grabung 1953 und 1955. Bonn. Mommsen, H., and P. Pavúk 2007. “Provenance of the Grey and Tan Wares from Troia, Cyprus and the Levant. The contribution of Neutron Activation Analysis.” Studia Troica 17: 25-41. Mylonas, G.E. 1975. Το διτικόν νεκροταφείον της Ελεuσίνος. Βιβλιοθήκη της εν Αθήναις Αρχαιολογικής Εταιρείας 81. Athens. Nikov, K. 1999. “ “Aeolian” Bucchero in Thrace?” Archaeologica Bulgarica III-2:31-42. Overbeck, J.C. 1989a. Keos 7. Ayia Irini. Period IV, 1. The stratigraphy and the find deposits. Mainz. Overbeck, J.C. 1989b. The Bronze Age Pottery from the Kastro at Paros. Studies in Mediterranean Archaeology and Literature, Pocket Book 78. Jonstered. Özdoğan, M. 1993. “The Second Millennium of the Marmara Region.” IstMitt 43:151-164. Pavlović, A. 1993. Het Vroeg Brons aardewerk van Ilıpınar. Unpublished M.A. Thesis. Den Haag. Pavúk, P. 2002a. “Troia VI and VIIa. The Blegen Pottery Shapes: Towards a Typology.” Studia Troica 12:35-71. Pavúk, P. 2002b. “Das Aufkommen und die Verbreitung der Grauminyschen Ware in Westanatolien.” In Brückenland Anatolien? Ursachen, Extensität und Modi des Kulturaustausches zwischen Anatolien und seinen Nachbarn, edited by H. Blum, B. Faist, P. Pfälzner, and A.-M. Wittke, 99-115. Tübingen. Pavúk, P. 2005. “Aegeans and Anatolians. A Trojan Perspective.” In EMPORIA. Aegeans in central and eastern Mediterranean. Proceedings of the 10th International Aegean Conference / 10e Rencontre égéenne internationale, Italian School of Archaeology in Athens, 14-18 April 2004, edited by R. Laffineur, and E. Greco, 269-279. Aegaeum 25. Liège. Pavúk, P. 2007a. “What can Troia tell us about the MH Period in the southern Aegean?” In Middle Helladic Pottery and Synchronisms. Proceedings of the International Workshop held at Salzburg, October 31st-November 2nd, 2004, edited by Felten, F., W. Gauß, and R. Smetana, 295-308. Ägina-Kolonna, Forschungen und Ergebnisse 1, CChEM 14. Vienna. Pavúk, P. 2007b. “New Perspectives on Troia VI Chronology.” In The Synchronization of Civilizations in the Eastern Mediterranean in the 2nd Millennium BC (III). Proceedings of the 2nd SCIEM2000 – EuroConference Vienna, 28 May - 1 June 2003, edited by Bietak, M., 473-478. Vienna. Pavúk, P. (in print). “Minyan or not. The second millennium Grey Ware in western Anatolia and its relation to Mainland Greece.” In MESOHELLADIKA. The Greek Mainland in the Middle Bronze Age. International Conference, Athens, 8.-12. March 2006, edited by Touchais, G. et al. Athens. Petrakis, V., and Moutzouridis, P. (in print). “Grey wares from the Bronze Age settlement of Koukonisi on Lemnos: First presentation.” In MESOHELLADIKA. The Greek Mainland in the Middle Bronze Age. International Conference, Athens, 8.-12. March 2006, edited by Touchais, G. et al. Athens. Privitera, S. 2005. “Hephaestia on Lemnos and the Mycenaean Presence in the Islands of the Northeastern Aegean.” In EMPORIA. Aegeans in central and eastern Mediterranean. Proceedings of the 10th International Aegean Conference / 10e Rencontre égéenne internationale, Italian School of Archaeology in Athens, 14-18 April 2004, edited by R. Laffineur, and E. Greco, 227-238. Aegaeum 25. Liège - Austin. Radford, C.A.R., and W.A. Heurtley 1927-28. “Two prehistoric sites in Chalcidice.” BSA 29:117-186. Radt, W. 1992. “Die frühesten Wehrmauern von Pergamon und die zugehörigen Keramikfunde.“ IstMitt 42:163-234. Rutter, J.B. 1983. “Fine Gray-burnished Pottery of the Early Helladic III Period: The Ancestry of Gray Minyan.” Hesperia 52:327-355. Schachner, A. 1994/95. “Untersuchungen zur chronologischen Stellung der grau-minyschen Keramik in Westanatolien unter Berücksichtigung der Schliemann-Sammlung im Berliner Museum für Vor- und Frühgeschichte.” Acta praehistorica et archaeologica 26/27:90-115. Schachner, A. 1997. "Trojanische Keramik der SBZ im östlichen Mittelmeer." Türk Arkeoloji DergisiXXXI: 217-236. Schachner, A. 1999. “Der Hanay Tepe und seine Bedeutung für die bronzezeitliche Topographie der Troas: Die Prähistorischen Funde der Grabungen von Frank Calvert im Berliner Museum für Vor- und Frühgeschichte.” Acta praehistorica et archaeologica 31:7-47. Scholes, K. 1952. “The Cyclades in the Later Bronze Age: A Synopsis.” BSA 51:9-40. Spier, J. 1983. “Prehistoric and Protohistoric Periods.” In Sardis from Prehistoric to Roman Times. Results of the Archaeological Exploration of Sardis 1958-1975, edited by Hanfmann, G.M.A., and W.E. Mierse, 17-25. Cambridge, Massachusetts – London, England. Şahoğlu, Vasıf 2007. “Çeşme – Bağlararası: A New Settlement in Western Anatolia.” In Middle Helladic Pottery and Synchronisms. Proceedings of the International Workshop held at Salzburg, October 31st-November 2nd, 2004, edited by Felten, F., W. Gauß, and R. Smetana, 309-322. Ägina-Kolonna, Forschungen und Ergebnisse 1, CChEM 14. Vienna. Thissen, L. 1989/90. “Preliminary Report on the Archaeological Investigations at Ilıpınar in NW Anatolia.” Anatolica 16:80-111. Wace, A.J.B., and C.W. Blegen 1939. “Pottery as evidence for trade in the Aegean bronze age.” Klio 32:131-147. Wace, A.J.B., and M.S. Thompson. 1912. Prehistoric Thessaly. Cambridge. Zerner, C. 1993. “New Perspectives on Trade in the Middle and early Late Helladic Periods on the Mainland.” In Wace and Blegen. Pottery as Evidence for Trade in the Aegean Bronze Age 1939-1989, edited by C. Zerner, et al., 39-56. Amsterdam. 1 As a counterbalance, it is interesting to read, what Kurt Bittel had to say about Troy VI in his review of the third volume of the final Troy series (Bittel 1956). This article was published with the support of the Slovak Grant Agency, VEGA 1/4533/07. 2 Blegen’s Troy publication is well known and still useful: C.W. Blegen et al., Troy III: The Sixth Settlement (1953). The recent excavations at Troy conducted by the late Prof. Korfmann are published in preliminary reports in the journal Studia Troica. For a short review and a good bibliography on Liman Tepe and Panaztepe see A. Erkanal-Öktü, “Liman Tepe, Panaztepe”, in I. Pini (ed. ), Kleinere Griechische Sammlungen. Neufunde aus Griechenland und der Westlichen Türkei. CMS V, Suppl. 3,2 (2004), p. 656-658, Kocabaştepe is largely unpublished so far; for Smyrna see Bayne (op. cit., supra n. 1), p. 61-80, and for Çeşme see H. Erkanal and E. Karaturgut, “2002 yılı Çeşme-Bağlararası kazıları”, XXV. Kazı Sonuçları Toplantısı -2 (2004), p. 153-164 and V. Şahoğlu, “Çeşme – Bağlarası: A New Settlement in Western Anatolia”, in: F. Felten, W. Gauß and R. Smetana (eds. ), International Workshop "Middle Helladic Pottery and Synchronisms" in Salzburg (in print). 3 The Georgian finds are not published in well accessible publications, and the following remarks are based upon my impressions during a study trip to Georgia in September 2000. It will be attempted to complement the bibliography on this topic in the near future. Pavúk, P. "Grey Wares as a Phenomenon." 12 Jun. 2008. In: Horejs, B. - Pavúk, P. (eds. ): Aegean and Balkan Prehistory. http://www.aegeobalkanprehistory.net/index.php?p=article&id_art=5 (23 Apr. 2019).